The Meistervik mattress belongs to IKEA’s foam mattresses line, along with the Minnesund, Morgedal and Matrand mattress. As with any IKEA product, the quality is in well proportion to the price. Meaning, you get what you pay for. However, even the lower priced products can beat the quality of other brands’ products at the same price range. In this review we will go over the specifications, as well as pros and cons and customers’ opinions on the Meistervik foam mattress. The Meistervik mattress is quite similar to the Minnesund mattress from the same line since they differ in only a few aspects. Just like the Minnesund, the Meistervik mattress is made of poly foam of exactly 1.7 PCF. However, the Meistervik consists of two layers, the poly foam base and an additional poly foam layer, both of 1.7 PCF. The double layer adds some thickness to the mattress, making it 2 cm thicker than the Minnesund. The Meistervik comes in three sizes; full, twin and queen size. At 12 cm thickness, it provides enough resilience and support for the right consumers. Even though it is thicker than the Minnesund mattress, the Meistervik is still very thin and not suitable for everyday use by adults or teenagers. However, it is an affordable solution for kids and, as customers have stated, it is the perfect choice for any kind of bunk bed. The thinness of the mattress is also a plus since it is light weight and thus very flexible and compact. The materials Meistervik mattress is made of are the same as with the Minnesund mattress. The core is made out of polyurethane foam and so is the additional layer. The cover is removable and washable, allowing for easy cleaning and handling. The zipper is placed on the bottom of the mattress which makes it suitable for seating. However, there have been complaints among the consumers regarding the zipper, stating that it breaks off easily. IKEA does not sell mattress covers separately and, thus, you should be careful when using the zipper. Another thing the consumers found inconvenient is that the mattress doesn’t have fitted sheets made for it. Finding a fitted sheet for the Meistervik mattress might be a hassle since the mattress is not of the standard depth. The additional filling in this mattress consists of 65% viscose, 30% polyester and 5% modacrylic fiber wadding. 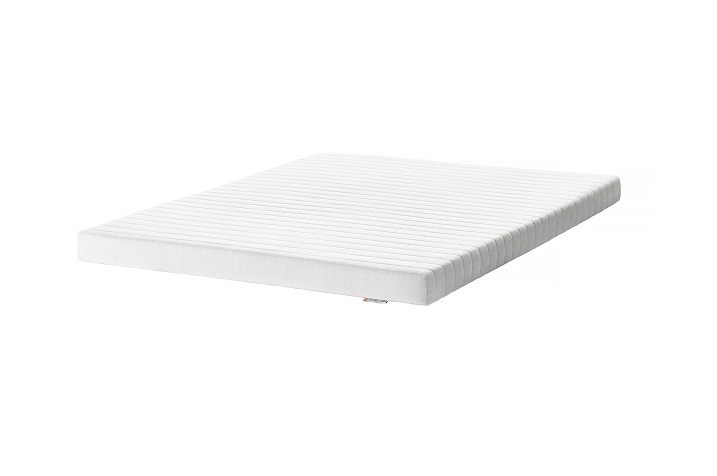 The lining is made of non-woven polypropylene while the ticking consists of 64 % polyester and 36 % cotton, making it the exact same combination as the Minnesund mattress. As with any other mattress, the cover comes with instructions that strictly prohibit bleaching, tumble drying, ironing and drycleaning. It should be washed in the normal washing machine cycle with hot water. With the additional poly foam layer, the Meistervik mattress has a 9 to 9.5 out of 10 firmness rate. Meaning, it is more firm than the Minnesund one, as well as more supportive and resilient. The noise is minimal, having in mind the mattress is completely made of foam and the motion transfer is satisfying, especially for couples sleeping on the same bed. There have been complaints about off-gassing when it comes to the Meistervik mattress. However, as with any mattress, especially the foam ones, off-gassing is normal since the materials have to let out the odor until they air out completely. Leaving the mattress exposed to a god air flow will help speed up the airing process but it will take at least a few weeks for it to stop releasing odors. The consumers have also complained about the mattress warming up quickly, especially during hot weather. That is because none of its components are heat resistant. To help regulate the heat, getting a gel topper is recommended. As previously said, this mattress offers a great sleeping experience for light weight users and mostly kids. The mattress itself is not that great of a solution for adults, especially the elderly. Just like the Minnesund mattress, the Meistervik should be matched with a slatted bed base or a mattress base from IKEA, to achieve the best results. It can be used on traditional bed settings as well but the overall comfort would be slightly reduced. Luckily, IKEA products such as bed bases and mattress bases are extremely affordable and the price of the whole set up would still be lower than some brands’ prices of the mattresses alone. It’s IKEA we’re talking about so, of course, the price is totally affordable, considering the amount of quality you are receiving. The mattress is available to be purchased at the online store but IKEA always preferred in-store buying since you can more accurately determine which product suits you best. Even though buying the mattress with the corresponding bed base might cost a bit more than the prices listed above, it is still a well worth investment, considering the quality you get. When buying in-store you can also save money on shipping since the Meistervik mattress comes roll packed and, thus, is compact and easy to transfer in a car. If you were to purchase it online, you would have to pay for the shipping additionally and wait a certain amount of time to receive the product. The mattress is ready for use right out of the package but keep in mind that, as with any roll packed mattress, it will take three or four days for it to get back into its regular shape. The Meistervik mattress is designed and made in Sweden, just like all of the mattresses from IKEA’s line. It comes with a regular 25 year limited warranty that covers all manufacturing defaults. Tearing of the mattress over time wont be covered by the warranty since it is bound to happen due to regular usage of the product. IKEA also offers a one year trial period during which you can replace the mattress you bought with another one that you might find more suitable. However, returning it for a refund is not an option. For your mattress to be eligible for the exchange, it has to be clean and undamaged. The Meistervik mattress belongs to IKEA’s foam mattresses line, along with the Minnesund, Morgedal and Matrand mattress. As with any IKEA product, the quality is in well proportion to the price.